The MotoGP franchise has long been the gold standard in racing games and the new iteration of MotoGP looks to take the unparalleled racing of previous versions to the current generation of consoles (the Sony Playstation 4, XBox One). The game possesses the high amount of customization that fans of the franchise eagerly anticipate but for my money the control scheme that is present is the primarily reason to purchase the title. The graphics in MotoGP 14 are as close to actually standing at a race track as possible while the environmental and overall track aspects of the title will further increase a player’s overall immersion in to the video game. MotoGP 14 has downloadable content (Laguna Seca) that will provide players with the ability to enter into other vehicles (Laguna Seca) which have their own unique handling acceleration and overall feel. The game works equally well whether one is playing and a single player or multiplayer modes – the AI that players will go up against in races on the single player mode is challenging and will require a number of attempts before one can be declared victorious. The multiplayer mode ratchets up this difficulty considerably well due to other human players becoming involved, the races become as competitive at some of the most memorable Grand Prix’s in history. That game has a tremendous amount of replay value to the differential feel that is present with each of the cars that has been included either in the base game or as downloadable content. 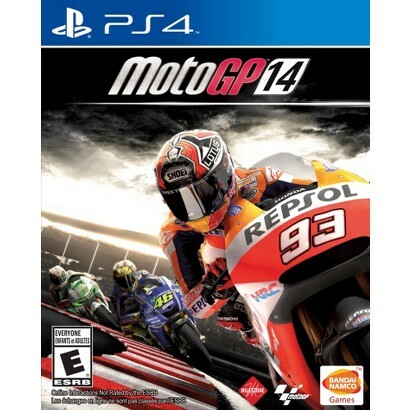 This would be a perfect purchase for anyone that is a fan of GP racing, the Moto GP line of games, or of titles where one is fully and utterly challenged. The control scheme is one that will allow players of a wide array of skill levels to succeed but requires one to be on the top of their game to truly master. MotoGP 14 would be a perfect purchase for anyone that is a fan of Grand Prix racing, the Moto GP franchise, or of titles that take a considerable amount of time to master. Make sure to visit the Bandai Namco website for additional information about the Moto GP line, the company’s product offerings through the holiday season and into 2015, and other promotions and downloadable content that the company may release for Moto GP 14. The title is also available on the previous generation of consoles meaning Playstation 3 and Xbox 360 players will have ample opportunity to play their favorite GP tracks.